Alexis HY is a manga-centric contemporary artist, who creates art based on manga culture. 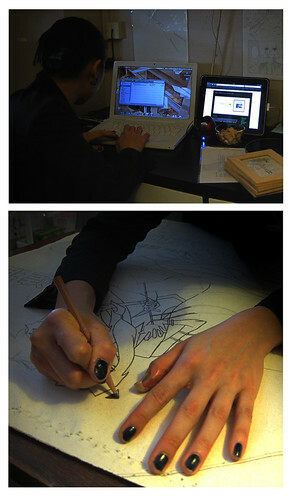 Her latest project is an original world concept and cast of characters Android Cats. We saw her recent solo exhibition P I E C E S: Locating a sense of self in manga held at the Japan Creative Centre in Aug 2012. Artitute had the honour to visit Alexis at her studio in Nov to speak to her about her residency with Studio Miu and a sneak preview to her creative process of Android Cats. 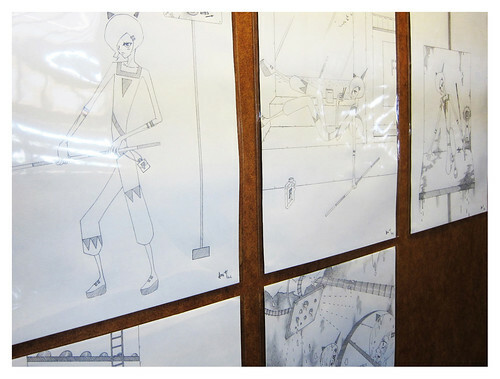 If you have great interest in Alexis’ manga-centric artworks, don’t miss out the chance to meet the artist and see her working! 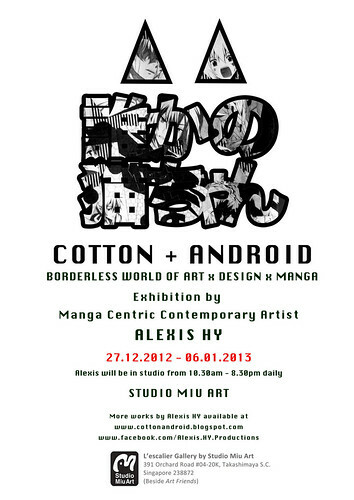 COTTON + ANDROID is a 10-day exhibition that showcases the Cotton Duck Diary series previously shown as “Cotton Duck Diary-in-progress” at the Japan Creative Centre, Embassy of Japan in Singapore, during the solo exhibition P I E C E S: Locating a sense of self in manga, and the development of an original world concept and characters Android Cats by Alexis HY. 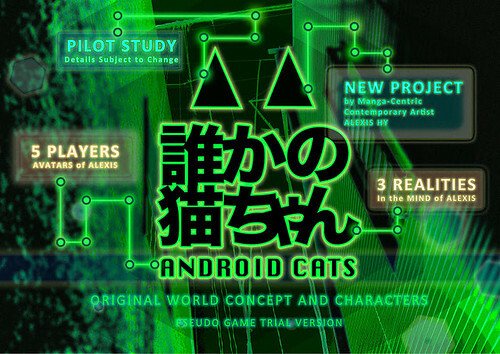 Android Cats is a project that uses the language of Japanese manga and visual novel game (interactive fiction) culture as a means of communication. Through the development of an original concept and characters, Alexis sets the foundation of a new world that is to be the platform for her imagination, communication and self-representation. From the beginning of her practice in 2006, Alexis has been focused on communicating her artistic identity in a way that embodies her experience of Japanese manga culture – an irreplaceable experience that connects her deeply and enduringly to the inner self. As an artist and fan of manga culture, Alexis hopes to capture the beauty of manga culture through her unique visualization of an inner life overflowing with manga images. This exhibition sits on an interactive platform and Alexis will be in the studio throughout the exhibition duration (10.30am to 8.30pm daily). 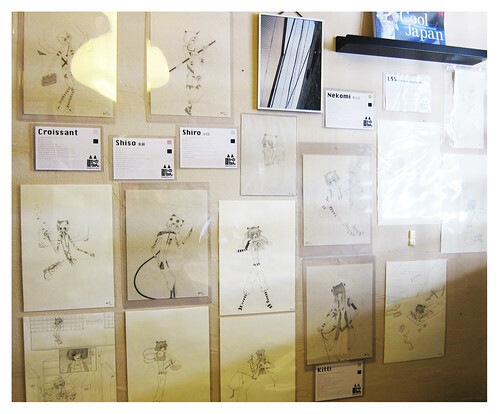 Please drop by to experience the borderless world of art, design and manga. For more information on COTTON + ANDROID and view the video here. This is Alexis’ third show at Studio Miu Art. Her most recent solo exhibition (17 – 31 Aug 2012) is P I E C E S: Locating a sense of self in manga held at the Japan Creative Centre, Embassy of Japan in Singapore. She has also recently attended the Teaching Japanese Popular Culture Conference held at the National University of Singapore on 11th and 12th November 2012 and participated in the Affordable Art Fair Singapore between 15 – 18 November 2012 (with Galerie Sogan & Art). The price range for the works is between SGD $10 – $7,800. Meo Alexis is the blogsite created in October 2011. Alexis continues to update and refresh the blog regularly. OPEN CALL: 5th Edition of [email protected] are looking for your photos!